There are a ton of tools out there for photographers to use when planning a photo shoot. 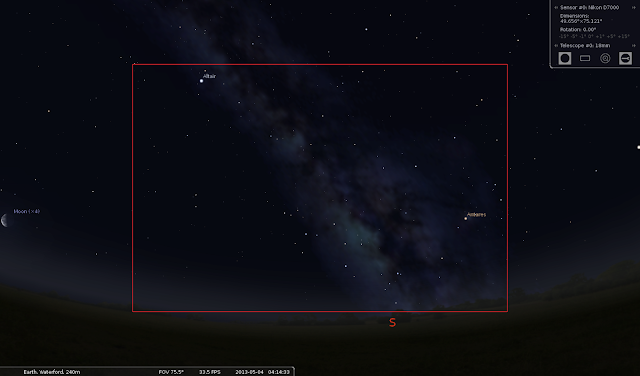 One "goto" tool that I find myself coming back to time and time again is Stellarium. If you are, or know any Landscape photographers you will know that getting the "perfect light" is an obsession. Why is it an obsession, simple, because it is the "special sauce" of photography. Lighting is what will transform a good photograph into an excellent work of art! With Landscape astrophotography the light isn't from our sun, it is from all of the suns that light the night sky (normal people might call them stars). Stellarium is a free download and works on most computer platforms out there. One of the great things about this program is the ability for the user to manipulate the settings. You have control over the levels of light pollution, limiting magnitude of stars, and it even gives you the ability to know exactly what you will capture with almost any camera and lens combination. Like anything you do have to do some homework, and there will be a bit of a learning curve to figure everything out, but believe me, you will be glad that you did. 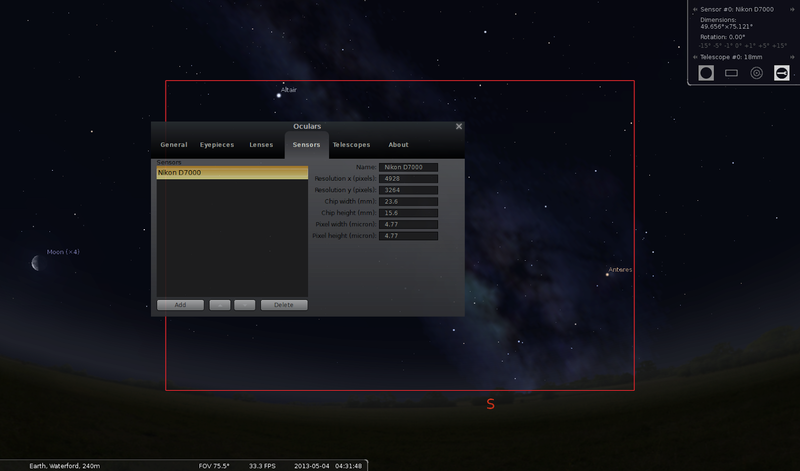 Today, I will be showing you how to set up Stellarium to plan a widefield Milky Way image. This is an invaluable tool if you truly want to "Plan" you image and are concerned with the angle of the Milky Way, the direction in which it breaks the horizon, how much is visible, how high is the arch and even what planets may be included in the image. If you'd like to learn how to change the settings, read on. The red area in the image below is what would be captured by a Nikon D7000 using the Nikon AF-S DX Nikkor 18-70mm f/3.5-4.5G IF @ 18mm. Stellarium has made it quite simple to change these settings. You do need to know the specifications of your camera though. That information can be looked up online if needed. The same goes for the lens data. If you click on the icon in the top right corner that has the wrench in in you will get a pop up screen with the title "Oculars". This pop up screen is where both the changes to the sensor settings and the lens settings are made. by changing these fields to correspond with your camera sensor you can now get a good idea what you will be imaging by using your camera. 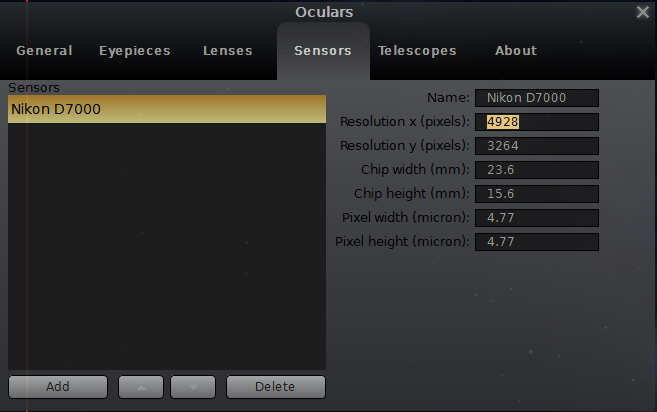 The "Lens" data is changed in the "Telescopes" tab of the settings with my lens, the Nikon AF-S DX Nikkor 18-70mm f/3.5-4.5G IF used @ 18mm the settings are changed as you see in the above image and below in text. 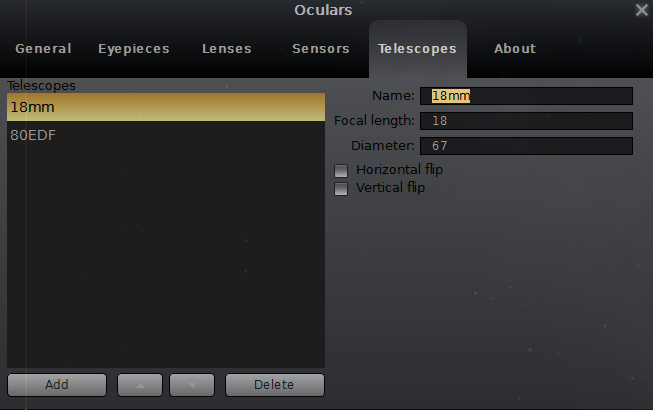 There is the ablility for you to change these settings to pretty much any lens or scope you could possibly use. If you use this tool along with the tools that you already use, I will almost guarantee that you will have a much better time photographing the milky way, and your composition will be far better than it has been in the past.